Meet Gavin Law Offices Client: Meade Fitzgerald, Owner of Trails & Shores. 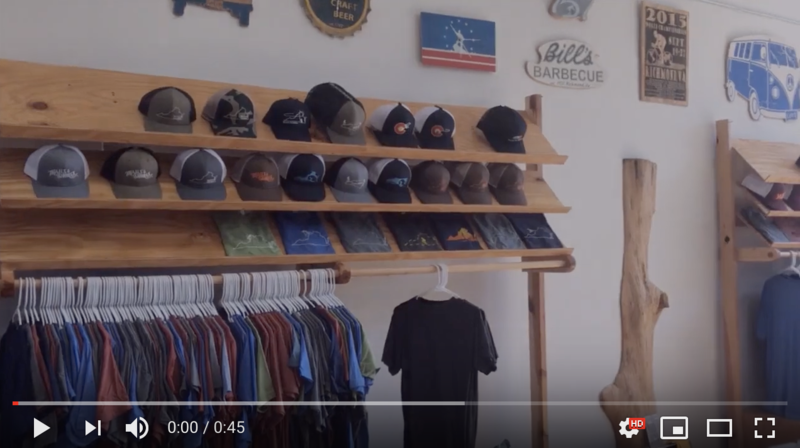 Trails & Shores is an outdoor-themed apparel company established in 2016. They are a team of outdoor enthusiasts with professional experience in the design, print, and apparel industry. 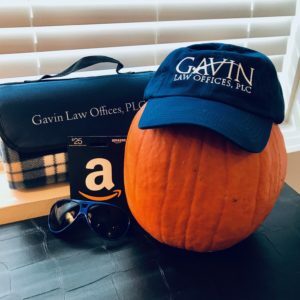 Happy October, friends of Gavin Law! This month we want to educate you guys about something near and dear… to the heart of copyright law- the idea-expression dichotomy! I see your eyes have glazed over. Keep reading, there are pumpkins ahead, and a prize! This Halloween, it’s likely that you and your friends and/or family will be carving pumpkins. Maybe you are a very crafty person and are able to carve an elaborate parody of a movie that came out this year. Maybe, like me, you’re going to stick with a modest challenge of a black cat or a spider. Or maybe, you’ll go for the classic, a scary pumpkin face. In copyright law, the idea of a cat, or a spider, or a face, cannot by itself be protected. However, when the carver expresses their version of this idea onto the pumpkin, that design can be protected. The main concept to take away here is really that you cannot protect ideas, but rather how you express those ideas in a tangible way. The reason for this is because humans are fascinating and can interpret one idea in millions of different ways. If you want to write a story about the idea an orphan who saves the world, you could end up with Harry Potter or Star Wars. For Halloween, we are going to challenge you. Our IDEA- the classic pumpkin face. Give us your goofiest, most creative, scariest pumpkin and you will have the chance to win a $25.00 Amazon gift card. That should buy you enough candy to restock your house after the trick or treaters come by. We at GLO will vote on our favorite pumpkin and get back to you. Send us those pictures! Or ask us more about copyright law, if you want. Art and intellectual property law intersect in many obvious ways—intellectual property is, after all, the protection of human creation. However, copyright normally gets a lot of the spotlight. There is art in trademark law, don’t get me wrong. Andy Warhol’s series on consumer products are some of the most well-known works of art incorporating brands, and additionally commenting on them. However, I find that I less often find incorporation of trademarks in art that aren’t a commentary on consumerist culture. This month, I was fortunate enough to encounter such a piece at the VCU Institute of Contemporary Art. 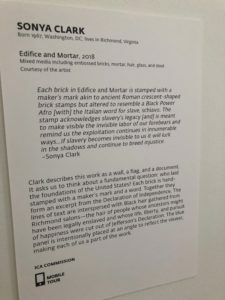 In the Declaration Exhibit, I found the piece Edifice and Mortar by Sonya Clark. Clark used the unusual mediums of brick, hair donated by local Richmond barbers, and a blue glass mirror. 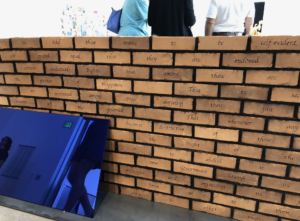 She created a rectangular shape out of bricks and then incorporated the blue mirror so as to represent a subverted American flag. She then imprinted a portion of the Declaration of Independence on the front and TRADEMARKS on the back. Okay, I’m getting ahead of myself. The words imprinted onto the back of the “flag” was not what you would consider a modern day trademark. However, trademarks are the oldest form of intellectual property, some say back to Roman times. Artisans would stamp their “mark” into goods that they had a hand in producing. Consumers could see these branded goods and be sure of the quality of the good that they would receive, because trademarks are, at their essence, an indicator of source. 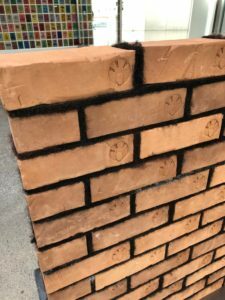 The twist here, is that the bricks reveal stamps that say “El Schiavo”, Italian for “Slave”. This piece successfully integrates the concept of trademark law and consumer protection into a beautiful commentary on society, which often ignores the monumental part that slaves played in building our nation. This is especially poignant in Richmond, the second largest slave importation city in the nation during the time of slavery. Looking back to the mediums used, the hair donated by local Richmond barbers is very likely hair from descendants of slaves. Kudos to Clark for creating such a thought-provoking piece.